Heading out into the wilderness is something that you definitely need to be careful about. You want to make sure that you have everything you need and you’re fully prepared. With any of these EDC backpacks, you’re going to have something that you can count on and something that will carry whatever you may need. This EDC backpack buying guide is going to help you decide just what you need to head out the next time. Waterproof: Not just water resistant but actually waterproof, so if you drop it in a puddle (or a river) or it gets wet in a rainstorm you’ll be able to stay comfortable and keep everything in it still safe and ready to go. 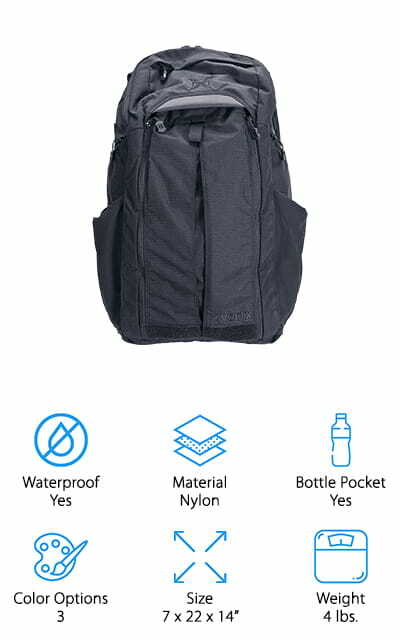 Material: There are plenty of different materials available when it comes to backpacks so this may be about personal preference or it may be about durability. Some materials are more waterproof or they’re stronger. Water Bottle Pocket: A special pocket on the outside for your water bottle can be convenient so you don’t need to take the pack off when you’re ready for a drink. You can keep walking and grab your bottle that easy. Color Options: Okay, so this is a personal preference but how many color options are you going to have? Can you get your favorite color or one that’s going to work with all of your stuff? It’s all about you right here. Size: Just how big is the bag? This is going to affect how much it can hold and that’s definitely an important step. If you need a large bag for all your stuff or a smaller one this is where you’re going to find out what you have. Weight: How much does the bag itself weigh? You’re going to have to put all kinds of things in that bag so you don’t want it to weigh too much on its own or you could end up overloaded before you come close to filling it. Backpacks are everywhere, but not all of them can count as an EDC backpack. That’s why we’ve done some research and found 10 great options that will work for your EDC bag. 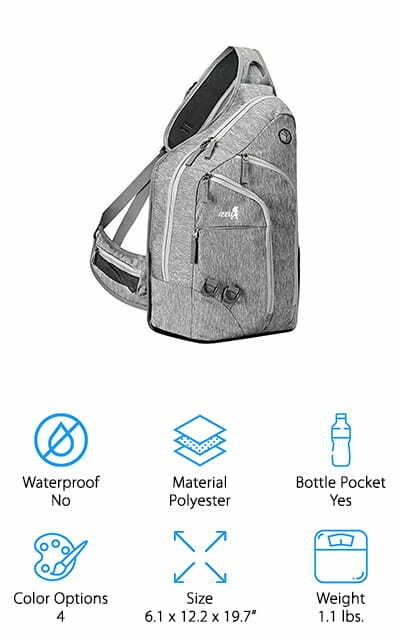 These are some of the best EDC backpacks for sale and these EDC backpack reviews are going to help you narrow things down quickly and get yourself ready for anything. Our top pick may not look like anything special but looks can definitely be deceiving when it comes to this everyday carry backpack. The 100% nylon frame with modular webbing over the shoulders makes for plenty of attachment points and water resistance so you’re safe even in the rain. It has 5 exterior zippered pockets as well as 3 interior zippered pockets and comes in 3 different colors for your personal preference. It’s durable enough to carry everything you’re going to need and then some. Weighing approximately 4 pounds completely empty, it has shoulder and hip straps to help distribute weight and keep you feeling comfortable even for longer hikes and walks. You’ll be able to organize everything you want and adjust all of the straps to fit you just right. 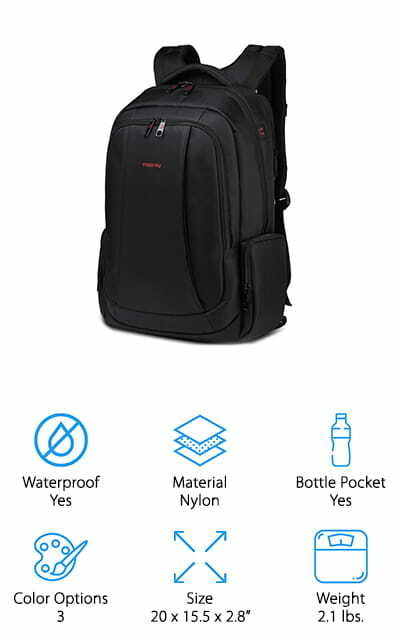 This sleek looking, best EDC laptop backpack comes in 3 different colors and 2 different sizes so you can easily carry a smaller or larger laptop along with you. There’s an anti-theft pocket for your laptop as well as a main compartment, an iPad pocket, 2 zippered bottle pockets on the sides and plenty of smaller pockets throughout that can hold things like notebooks, keys, pens, pencils, phones and a whole lot more. Made with 210D nylon fabric it is entirely water repellent and it’s simple to clean. The polyester lining helps to make the interior just as simple to clean as the outside and keeps it looking great. You’ll be able to load up to 88 pounds and still stay comfortable and secure with this bag. It features a padded back cushion and thick shoulder straps to help distribute weight. Plus you have a 90 day money back guarantee and a 1 year warranty to this best cheap EDC backpack. 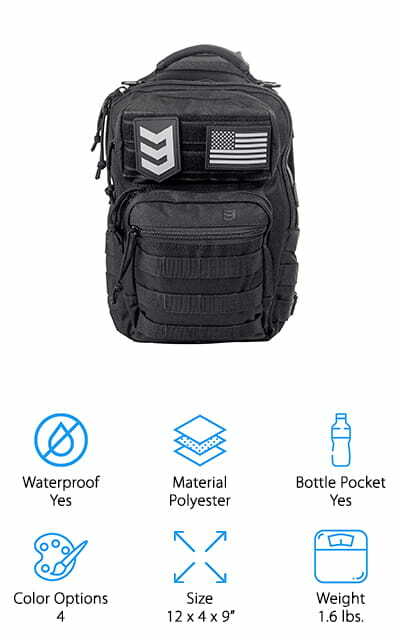 This best tactical EDC backpack comes in 4 different colors for your personal preference and is actually designed for carrying concealed weapons. It has several pockets that will hold anything and everything you need but it’s the front that you’re really going to want to look at. That’s because it has a divider, keeper, elastic mag loops and a drainage grommet. On the inside, there are dividers and internal zipper pouches for different equipment you may need as well. Designed for ambidextrous use, this bag has thick shoulder straps and 2” webbing and buckle that can easily be concealed. It’s made with a 600 denier PVC backed polyester for durability and features a small profile that will help you get what you need quickly. 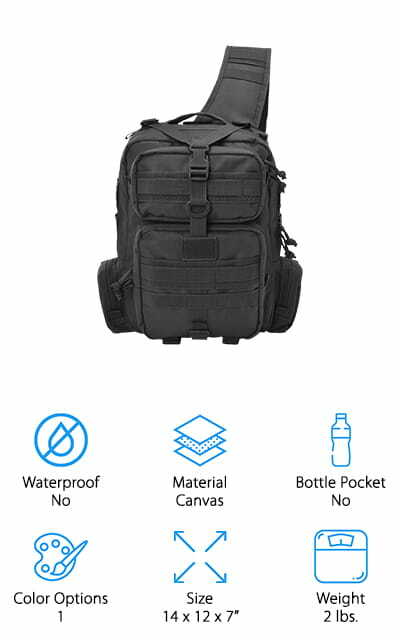 This best EDC tactical backpack comes in 4 different colors and has a cubic volume of 320”. It’s moderately priced and can hold a number of your most needed items with straps, pockets and zippers to keep things organized and at the ready. It can be configured in 3 different ways for shoulder carry, chest or back sling or a hand carry and has a padded strap that keeps you comfortable for as long as you need. The MOLLE compatible pouch keeps all of your gear and it’s made with 900D fabric that makes it work for indoor or outdoor uses. The reflective safety patch makes you visible at night for safety and it’s Velcro backed, which means you can use it for signaling help, as a trail marker or for anything else. It even has a thick padded back pocket for concealed carry if you prefer and is shipped from the USA. This stylish urban EDC backpack is great for just about any purpose and holds 28 liters worth of whatever you want. Available in 4 fun colors, it has plenty of pockets on the inside and outside as well as loops to attach your accessories and a headphone port to let you listen to your music. The crossbody design makes it easy to carry and keeps the weight relatively balanced across your back. Made with polyester, it’s scratch resistant and dirt-proof so you don’t have to worry about durability or how it’s going to look over time. This backpack is lightweight and can be used for just about any purpose from school to heading out into the wilderness. Adjustable to fit users of just about any size, it’s definitely a bag you’re going to want to take a closer look at. 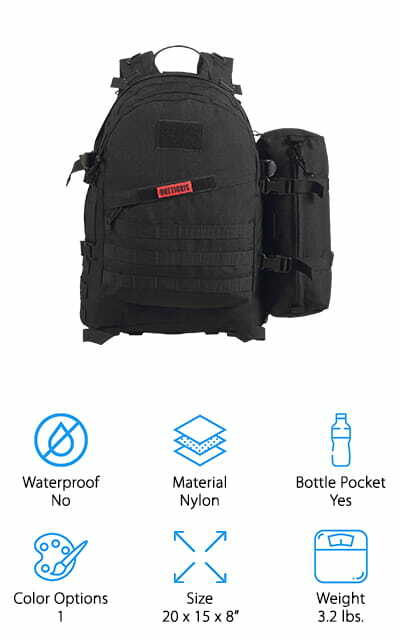 This full backpack is MOLLE compatible and is actually considered a military assault backpack. It’s durable and ready to carry anything and everything you might need with the oversized, snag-free zippers, plenty of pockets on the inside and outside for organization and the 1000D nylon frame. The webbing gives you plenty of space to hold all of your tools and there’s even space for a hydration bladder with an outlet to keep you fully hydrated. The padded waist strap is fully adjustable and the wide shoulder straps have quick disconnects. Designed to hold up to 50 liters, this 3 day pack has an expansion pack included and a soft back panel that keeps you comfortable while you move. You’ll be able to carry just about anything you could need and prepare yourself for whatever might be coming next. 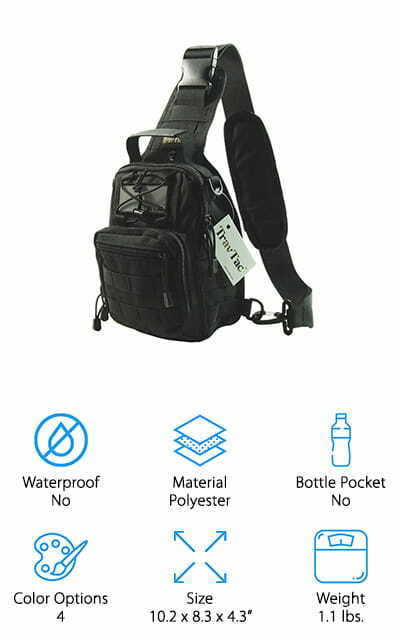 With this small EDC backpack, you’re getting a whole lot of features, pockets, and webbing to carry anything and everything you might need. The oversized shoulder strap will provide better weight distribution and also helps provide padding to keep you comfortable. The straps and pockets help with organizing everything that you need and there are even buckles and clips to keep everything right where it needs to be. There’s a Velcro attached section that is concealed in the back and it has enough space to carry your laptop, iPad and more or even your weapon for concealed carry. This 600D polyester pack is water resistant and has double stitching and heavy duty zippers as well as a front load compression system. The padding in the back and the strap are designed to be breathable for longer use and the cord pulls are made with utility styling. Here we have a MOLLE compatible assault range bag that is available in 2 different colors and easily slings over your shoulder for carrying comfort. The shoulder strap has plenty of padding to keep you comfortable and there’s also a waist strap if you need to reduce the amount of swaying in the bag. There’s a concealed back compartment for your weapon and plenty of pockets throughout for your laptop, notebooks, books, keys, phone and anything else that you might need to carry around. There’s even a hydration pocket for a 2 liter hydration bladder. The double stitched bag with heavy duty zippers and cords also has a compression system that helps to balance out the weight and keep everything tucked in as small as possible. You can easily use this bag for just about anything from heading out to the range to heading into the wilderness. With this EDC (everyday carry), bag you can easily carry anything and everything you might want over your shoulder. It comes in 2 colors and is made with 1000D nylon fabric that is lightweight but still ultra-durable, scratch-resistant and waterproof. This 2-in-1 sling bag can be used as a sling pack or a briefcase and has an adjustable strap to make it fit comfortably. There are plenty of pockets and dividers inside that will make it easy to keep all of your stuff organized and the bag itself is outfitted with a MOLLE system. There are pockets for your accessories, water bottle and more as well as a padded bag at the back. Even though it’s small you’ll still be able to fit a great deal inside it without having to worry about it being too heavy for you to carry throughout the day. 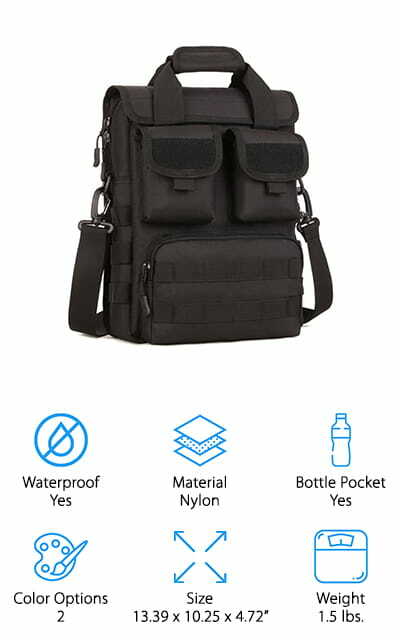 Finally, we have the Dragon Ninja Sling Bag, which is the best small EDC backpack, available in 2 colors and comes in a small size that’s super convenient to carry with you anywhere. It weighs less than 1 pound by itself and still has space for your gear if you’re heading outdoors for any purpose. 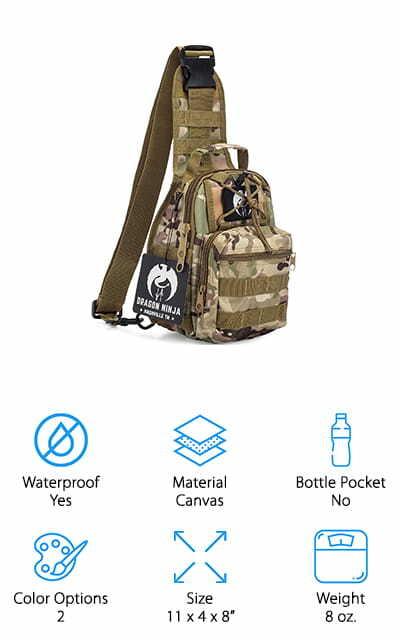 Made with waterproof and abrasion resistant materials, it uses a MOLLE webbing system that lets you carry all of your gear easily. The pouches are divided to provide you with plenty of space for organization and the shoulder strap is ambidextrous, allowing you to use it how you like. Even better, there’s plenty of padding to the shoulder strap and the mesh backing to keep you comfortable and cool while you’re moving. There’s a 100% satisfaction guarantee that says you can get your money back within 90 days and you can rely on the 1 year limited warranty.